Middle school, also known as Junior High school, is a school in the secondary educational system that usually bridges the gap between elementary and high school. The exact organization varies, but most often middle schools consist of sixth, seventh, and eighth grades, students usually being between the ages of 12-14. Junior high schools traditionally include only seventh and eighth grades. The middle school is most common in the United States. Variations of middle schools exist in education systems around the world, although in some countries there is no designated school that bridges between elementary and high school. The middle school years are a significant time in compulsory schooling for students, as educational expectations rise and the social and biological changes of puberty affect the students. The middle school was established to act as a transition, moving the student away from the world of childhood and introducing social skills and mastery of knowledge and techniques that will be further developed in high school. To succeed in this role, middle schools nurture their students socially and emotionally, providing guidance in social relationships as well as academic and other studies. The middle school years are a significant time in compulsory schooling for students, as educational expectations rise and the social and biological changes of puberty affect the students. Hence, the primary purpose of a middle school is to serve as an educational facility to help in the transition from primary to secondary education, often by combining elements of both upper primary and lower secondary school buildings to create an environment that is both familiar and new to its students. 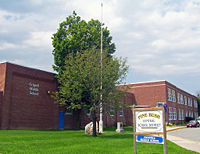 Crispell Middle School, Pine Brush, New York, United States of America, The U.S. The genesis for the middle school in the United States came in the late nineteenth century, with a major study by the president of Harvard University and the National Education Association's Committee of Ten on Secondary School Studies that outlined a re-organization of education in America. At that time, education was mostly broken up into elementary schools, which consisted of grades 1-8, and high schools, grades 9-12. The core argument of the study was that students would benefit from starting more advanced studies earlier in their education, and suggested that elementary schools be compromised of grades 1-6 and high schools grades 7-12. In 1909, the first junior high schools were established in Columbus, Ohio, compromising grades 7-8. It was not long before more junior high schools started to develop in other parts of the country. These schools were largely focused upon transitioning students from elementary studies to more advanced subjects and extracurricular activities, such as sports, in order to properly prepare students for high schools, which were seen as being the preparation for college. 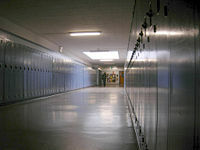 A hallway at the Eckstein Middle School, Seattle, Washington. In the middle of the twentieth century, a new movement began that eventually established the middle school. While junior high schools were popular, there were also areas for improvement. Some of the difficulties with junior high schools were economic and logistical; and establishing junior high schools for students for only two years was an additional burden upon resources for school districts. The short time span of junior high also meant that the social relationships of students became fractured and strained during the years between sixth and ninth grade. The first middle school in America opened in Bay City, Michigan, in 1950. Structured to host students from grades six through eight, the early middle school movement was based upon the belief that by the time students entered sixth grade, they were intellectually and socially advanced beyond the confines of elementary schools, and that as most students in sixth grade were of the age of puberty, and hence entering the first stages of adulthood, sixth grade was the appropriate grade to begin to transition from elementary to secondary education. The spread of middle schools also helped logistical problems, such as overcrowding, and spread teachers and administrators more evenly among districts. Today, middle and junior high schools exist in America, and while often these terms can be used interchangeably, the grades are often divided differently among the two, with junior high schools taking students in seventh and eighth grades while middle schools include sixth grade as well. Like other schools in the U. S., middle schools can be either public or private institutions. Public middle schools are under the jurisdiction of local school boards and state education departments, and are usually funded by a mixture of local and state taxes. Many public school districts are set up so that the many different schools can work interconnected with one another in the flow and maturation of students. As such, middle schools work closely with elementary schools for incoming students, and with high school in regards to their graduating students. Private middle schools, while less populous than public schools, do exist in many areas of the United States. Some of these schools are religiously affiliated, while others are secular and are more like preparatory schools. Private schools are funded through endowments and tuition and so are not under the regulation of local or state education agencies. Private and public middle schools generally have similar administrative organizations. Usually a principal, dean, or headmaster is in charge of the overall school operations, assisted by subordinate administrators. Most middle schools also have a guidance staff, which helps plan students' schedules and act as advocates for a wide array of student needs. School psychologists and social workers may also serve as members of the staff. Stanton Middle School in Kent, Ohio, showing gym and south end of building. Most middle schools have facilities comparable to high schools, only on a smaller scale. In addition to regular classrooms, most middle schools are equipped with cafeterias to serve food to students, gymnasiums for physical education, auditoriums for assemblies and student performances, and health or nurse's offices to ensure the daily safety and physical well-being of the student population. Depending upon budgeting and curricular restraints, middle schools may also have laboratory facilities for science classes, art and music rooms, and equipment and computer rooms. Most middle schools will also have outside sport arenas, such as football, baseball, soccer, and running tracks; sometimes a single area will be used for all such activities. The existence and purpose of middle schools is quite varied around the world. While middle schools were developed in the U.S. as transitional facilities specifically designed to help students through the period of change between childhood's elementary education and into the secondary education of adolescence, in many countries no such system exists. In some, there is no transitional phase; students merely attend primary school and then high school, although these may be of different types depending on ability and other factors. In other countries, compulsory education ends after middle school and, therefore, for many students the transition is not into secondary education but rather into the workforce. Middle schools are rare in Africa, due to the political instability, poverty, disease, lack of infrastructure, and civil violence that have caused problems in many regions of the continent. Since many countries within Africa are still struggling to fully modernize, many areas have very basic schools that are usually underfunded and understaffed. Since middle schools are usually developed as bridges between well established primary and secondary schools, there are as yet few middle schools in many parts of Africa. Those countries with more established educational institutions, such as South Africa, Egypt, and Kenya, have generally divided their schools into primary and secondary systems. Education has always been important in the East, and the rapid modernization that swept through many Asia countries during the twentieth century has also ushered in the idea of middle schools. In the People's Republic of China, junior middle schools (chuzhong or 初中) refer to years seven through nine. This covers the last three years of the nine-year compulsory education, which is subject to fees. At the end of the last year, the college-bound students take exams to enter high school (gaozhong or 高中) others wishing to continue their training may enter technical high school (中学专科/中专) or vocational school (职业学校). 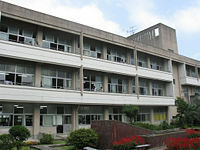 The courtyard and classrooms wing of Onizuka Middle School in Karatsu, Japan. Third year students have classes on the first floor, second year students the second, and first year students the third floor. In Japan, junior high schools, which cover years seven through nine, are called chū gakkō (中学校, literally, middle school). They are referred to as "junior high schools" in most conversations in English and are referred to by the Japanese Ministry of Education, Culture, Sports, Science, and Technology as "lower secondary schools." Junior High school is the last stage of compulsory education in Japan, after which those that plan to continue to the "higher secondary schools" are required to pay a small fee. Middle schools in South Korea consist of three grades. Most students enter at age 12 and finish at age 15 (western years). These three grades correspond roughly to grades seven through nine in the North American system and second to fourth form in the British system. Middle school in South Korea marks a considerable shift from elementary school, with students expected to take studies and school much more seriously. In France, the collège is the first level of secondary education in the French educational system. Entry into the sixième year, the first year of collège, occurs directly after the last year of primary school, called cours moyen deuxième année (CM2). There is no entrance examination into collège, yet administrators have established a comprehensive academic examination for pupils starting sixième, the purpose of which is to evaluate the level of each pupil on graduation from primary school. In Italy, middle school (scuola media) refers to the three years of schooling for students aged between 10-11 and 13-14. At the end of the third year, students have to take a final test due to complete this grade. Middle school in Italy is the last year of compulsory education. However, the legal age to begin employment is 16, and so even students who do not wish to continue their studies after middle school usually enroll in a short professional course (two years). In the United Kingdom, all middle schools must be deemed either primary or secondary. Thus, schools which accept pupils up to age 12 are entitled middle-deemed-primary, while those accepting pupils aged 13 or over are entitled middle-deemed-secondary. For statistical purposes, such schools are often included under primary and secondary categories "as deemed." Notably, most schools also follow teaching patterns in line with their deemed status, with most deemed-primary schools offering a primary-style curriculum taught by one class teacher, and most deemed-secondary schools adopting a more specialist-centered approach with multiple teachers. Gymnasium (middle school) of Janusz Kusociński in Mińsk Mazowiecki, Poland. In Germany, schools that may be considered middle schools, include the Hauptschule and Realschule. A Hauptschule is a secondary school starting after four years of elementary schooling. Any student who has completed a German elementary school can attend a Hauptschule, whereas students who want to attend a Realschule or Gymnasium must achieve a certain academic standard. The students spend five to six years at the Hauptschule, from fifth to ninth (or tenth) grade. They finish at about age 15 or 16. Conversely, pupils start at a Realschule at the age of eleven or twelve and typically finish school at the age of 16, when they are expected to take on an apprenticeship. The Realschule is ranked between Hauptschule (lowest) and Gymnasium (highest) in the secondary school system. In Poland, the gymnasium is a type of middle school, consisting of three years of education starting at age 13 to 14, following six years of elementary school. This level of education is compulsory for all students. After this gymnasium students may enroll in the non-mandatory three years liceum, four years technikum, or two or three years of vocational technical school. In New Zealand, "intermediate schools" cover years seven and eight (formerly known as form one and two), with children aged 11 to 12 in areas where the local primary schools teach students in year one to year six. Many primary schools, however, also teach year seven and eight. These primary schools may have a relationship with a nearby intermediate school to teach manual training classes such as woodwork. At the beginning of the twenty-first century, junior high schools covering years seven to ten, the four years between primary and the National Certificate of Educational Achievement (NCEA), were established. Generally, education in Australia follows the three-tier model which includes primary education (primary schools), followed by secondary education (secondary schools/high schools) and tertiary education (universities and/or TAFE (Technical and Further Education Colleges)). It was not until the the early twenty-first century that separate middle schools started to develop within this system, but it has not been a widespread movement; in fact, there has been much debate over the effectiveness of middle schools within Australia. While middle schools are rare in South America, many countries recognize that there is a transitional period for students between primary and secondary education. In many places, the last years of primary school (or the first of secondary, depending upon the location) are labeled as later stages in primary education (beginning stages in secondary). For example, in Brazil, "fundamental education" is mandatory for children ages 6 to 14. There are nine "years" (as opposed to the former eight "grades"), and years six, seven, eight, and nine are designated as Ensino Fundamental II. In Venezuela, students attend primary school until they are eleven. They are then promoted to the second level of basic education, where they stay until they are 14 or 15, at which point they are then given the choice to continue their education or enter the workforce. ↑ 1.0 1.1 Douglas MacIver and Allen Ruby, Middle Schools, Encyclopedia of Education, Gale Group, Inc., 2002. Retrieved August 21, 2008. ↑ 2.0 2.1 Ron Banks, Middle School, Clearinghouse on Early Education and Parenting, 2004. Retrieved August 21, 2008. ↑ Francois Louis, Secondary Education in France: A Decade of Change (Organization for Economic Cooperation & Development, 1995, ISBN 9264145486). ↑ Her Majesty's Stationery Office, The Education (Middle School) (England) Regulations, 2002. Retrieved July 27, 2008. ↑ Mollie Neville-Tisdall, "Pedagogy and Politics in New Zealand's Middle Schools" Middle School Journal 33(4) Mar 2002: 45-51. ↑ Rod Chadbourne, What makes middle schools and middle schooling distinctive, if anything? Queensland Journal of Educational Research 19(1) 2003: 3-12. Retrieved August 21, 2008. ↑ Folha OnLine, Ensino fundamental de 9 anos beneficia estudantes mais pobres, diz Lula. Retrieved August 21, 2008. Dickinson, Thomas S. Reinventing the Middle School . RoutledgeFalmer, 2001. ISBN 0415925924. McEwin, C. Kenneth, Thomas S. Dickinson, and Doris M. Jenkins. America's Middle Schools: Practices and Progress: A 25 Year Perspective. Columbus, OH: National Middle School Association, 1996. ISBN 1560901020. Fenwick, J. Taking Center Stage: A Commitment to Standards-Based Education for California's Middle Grades Students. Sacramento, CA: California Department of Education, 2001. Louis, Francois. Secondary Education in France: A Decade of Change. Organization for Economic Cooperation & Development, 1995. ISBN 9264145486. MacIver, Douglas and Allen Ruby. Middle Schools. Encyclopedia of Education Gale Group, Inc., 2002. Retrieved August 21, 2008. This page was last modified on 4 October 2018, at 14:59.